Naples, Italy - Military Sealift Command (MSC) ships USNS 2nd Lt. John P Bobo (T-AK 3008) and USNS LCPL Roy M Wheat (T-AK 3016) arrived off the coast of Monrovia, Liberia, in the Gulf of Guinea last month to participate in a sea-basing and humanitarian aid distribution exercise in conjunction with US Marines and Africa Partnership Station ships USS Fort McHenry (LSD 43) and HSV-2 Swift. Bobo and Wheat are US Navy cargo ships that are part of Maritime Prepositioning Ship Squadron (MPSRON) 1, one of three squadrons that preposition US military equipment in strategic locations at sea for rapid delivery ashore in response to military or humanitarian crises. These squadrons are commanded by a US Navy captain with an embarked military staff, while the ships themselves are crewed by US merchant mariners under contract to MSC. HSV-2 Swift, a high-speed vessel, is chartered by MSC, and is operated and crewed by US Navy Sailors. Africa Partnership Station (APS) is a US Naval Forces Europe initiative that provides maritime training to partner nations in West and Central Africa aboard Navy ships operating in the region. During the late March exercise, Bobo, Wheat, Swift and Fort McHenry congregated off the coast of Monrovia. Sailors embarked aboard Bobo and Wheat assembled the MPSRON's Improved Navy Lighter age System (INLS) (see picture) which is a roll-on/roll-off discharge platform comprised of barges and ferries that allow ships to off-load cargo at sea and deliver it ashore when traditional harbor facilities are unavailable. 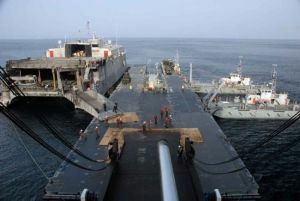 Once the INLS is assembled, cargo from Bobo, Wheat and Fort McHenry, including trucks, equipment and humanitarian aid supplies, was transferred at sea from Bobo to Swift while the high speed vessel was docked on the discharge platform. Swift then ferried these supplies to Monrovia where they were to be delivered to a number of schools and medical clinics in Liberia. The exercise, which showcased the real world application of the Navy's seabasing concept, also gave the ships, sailors and marines involved the opportunity to train alongside Liberian military personnel who participated in the operation. - Sealift Logistics Command Europe.